Beneath the eerie, arid cover by Tais Teng you’ll find an exciting pre-release peek at Advent by Michael Kamakana; transformative short fiction from Sylvia Stopforth, Richard J O’Brien, and Susan Pieters; aliens and insects from Jasmin Nyack and Charity Tahmaseb; poetry from James Norcliffe and Maria Pascualy; Spencer Stevens in the age of steam; runaway-turned-fugitive Allaigna in Aria; a return visit to Nine Isles with Joseph Stilwell and Hugh Henderson; and the winner of the Bumblebee Flash Fiction Contest. 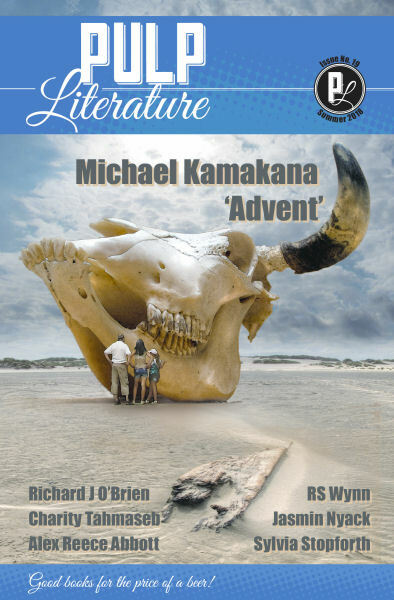 We lead with an excerpt from Advent, Michael Kamakana’s SF stunner of a debut novel, which opens with “When the aliens came it was not what we expected.” Need we say more? Another debut, Jasmin Nyack’s ‘Five Minutes’, has a totally different, and hilarious, take on alien invasion. Spencer Stevens travels to the age of steam in the newest Seven Swans novella by Mel Anastasiou, The Machineries of Progress, and we take a trip of a different kind in Maria Pascualy’s poem, ‘First Date’. Alex Reece Abbott’s short story, ‘My Brother Paulie’, is a sharp study of an altered state of being, and ‘Guardian’, by Susan Pieters, turns personal safety into claustrophobia and morphs danger into desire. We progress and evolve in new ways in Richard O’Brien’s ‘The Slade Transmutation’, another evolution occurs in ‘Ordinary’, by Sylvia Stopforth, and Allaigna adapts to her transformation from runaway to fugitive in the latest instalment of Allaigna’s Song: Aria by JM Landels. The grotesquery of flies has us itching for a swatter in James Norcliffe’s ‘He has this thing’, while Charity Tahmaseb’s ‘Potato Bug War’ has us rooting for the pests to survive. Bumblebee contest winner RS Wynn weaves five tight narratives into one flash fiction piece titled ‘Lullaby, Valentine, Paper Crane’ alongside the Surrey International Writers’ Conference Storyteller Award runner-up, ‘Towing the Mustang’ by Keltie Zubko. Last year, in the first chapter of Blue Skies Over Nine Isles by Joseph Stilwell and Hugh Henderson, we left Maxwell facing a threat and several questions. In Chapter two, Max gets a hand up, but don’t think for a second that his rescuer is giving him a handout.